October | 2009 | Where is Yvette? The Garden Route of South Africa is a lovely stretch of coastline that begins about 400km from Cape Town and ends 300km later in Port Elizabeth. For all intents and purposes it is like driving down the Pacific Coast Highway in California because the arid mountains meet the pounding surf, there are lots of cute little towns, and the whole area is filled with surfers. I’m not saying this like it’s a bad thing or anything, quite the contrary, just you need to pinch yourself to remember you’re not on the opposite side of the world. I was heading from Cape Town to Johannesburg overland on the Baz Bus, the South African backpacker bus that you should look into when traveling alone, hard to beat the price even if schedules can be a hassle, and my first stop on the Garden Route was at George. 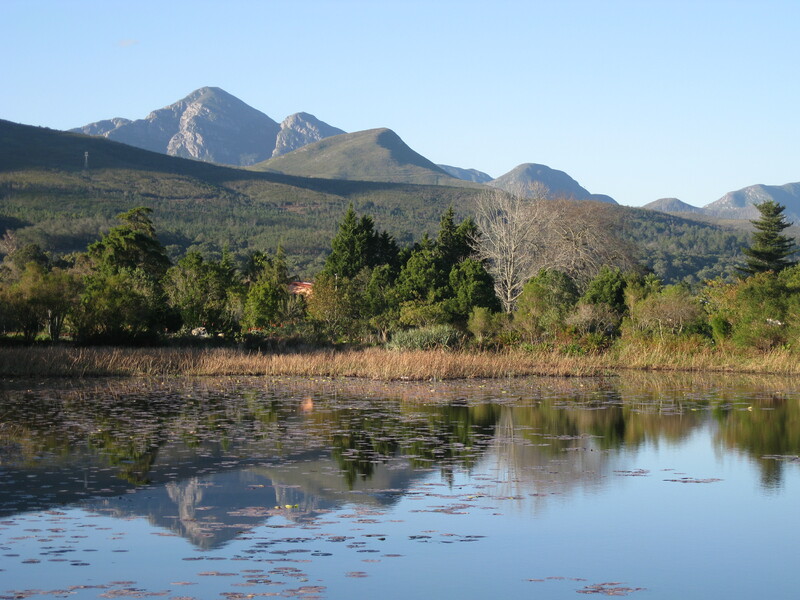 Which it turns out is a town in addition to a popular name in my family, and location of a very nice place called Outeniqua Backpackers run by a brother-sister couple. Oh, and where it turns out one is strange for not knowing that if you want to order a pizza you call the town deliveryman rather than the pizza parlor, as in a person whose job it is to deliver things. Once you get over that and realize this one man could conceivably deliver flowers and pizza on the same trip the possibilities get rather exciting. 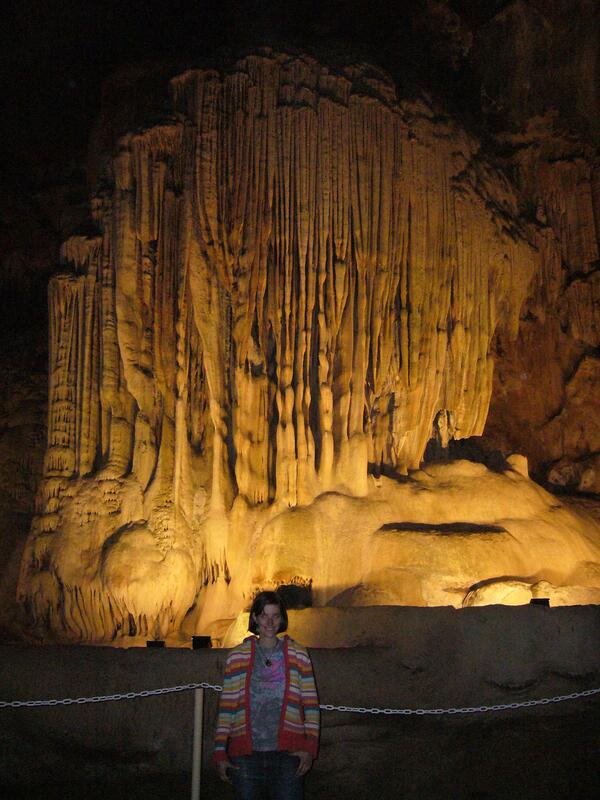 The Cango Caves! Yay! The caves have a lovely set of limestone formations, but the best thing to do is sign up for the “Adventure Tour,” meaning “crawl through narrow spaces kilometers underground and try not to think about how many people have gotten stuck here before.” Got to do the tour with a rather nice South African family on vacation, where the kids were really excited to meet an American and for some reason kept referring to me as “Miss Pennsylvania” as clearly all American chicks enter beauty pageants, or some such. The entrance to the Tunnel of Love on the Adventure Tour, also known as when things start to shrink up a little. Our guide says he lost all tact in telling people they were too fat to do the tour when a woman got stuck in this tunnel, sideways and in a split position, and was still hyperventilating after a few hours until he frankly told her “ma’am, if you don’t calm down you are going to die.” Personally such a statement would make me even more upset, but that’s just a South African guy for you. This is the narrowest part of the tour- a 30cm (less than a foot) gap called the Devil’s Post Box that you have to slide through. In actuality this wasn’t the hardest part of the tour- the hardest was a tiny 45cm (17″) chute called the Devil’s Chimney (clearly Lucifer was intimately involved in the naming process of early explorers). Said chute extends about 3.5 meters upwards, so there is much inelegant wiggling involved to get up there. I should also note that this was all about 1.5km below the surface and when one of the South African kids asked their dad what would happen should there be an earthquake right then the nervous-looking dad who tended towards claustrophobia told his offspring to hush up. About an hour outside Cape Town you come across fertile hills and rolling valleys, all covered by the lovely tangle of grape vines. This is Stellenbosch, the Cape winelands region. If you get anything out of what I’m saying today it should be this- South African wine is severely under-appreciated on the world stage. This is mainly because for years no one bought the stuff because of an international trade embargo against the apartheid government, but nowadays the exchange rate is good and the wine is better. In a few years when South African wine becomes really popular (and it’s only a matter of time) don’t say I didn’t warn you. 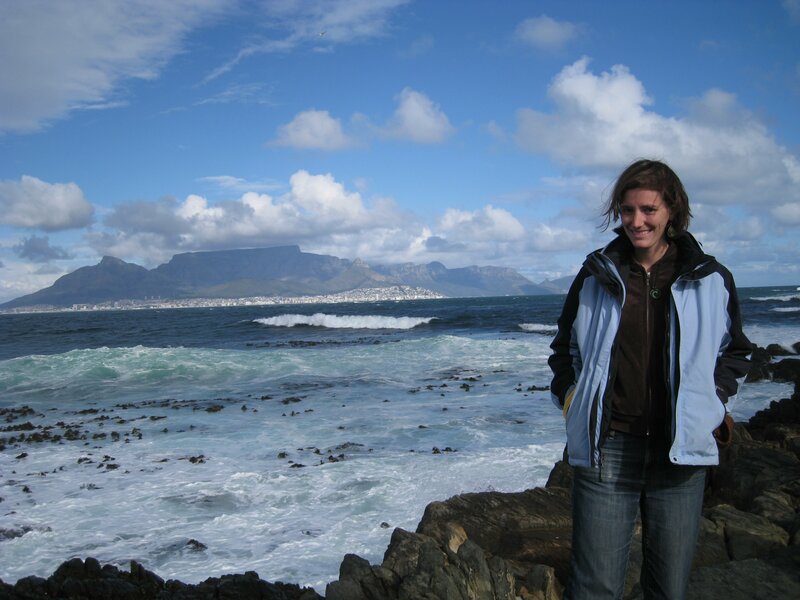 I went to the Stellenbosch area twice, once with my family because my dad was giving a talk for some engineers from the University of Stellenbosch (they held the talk at a winery by the way which made me jealous- I think we’d no longer have attendance rate issues if we held our colloquiums at a winery!) 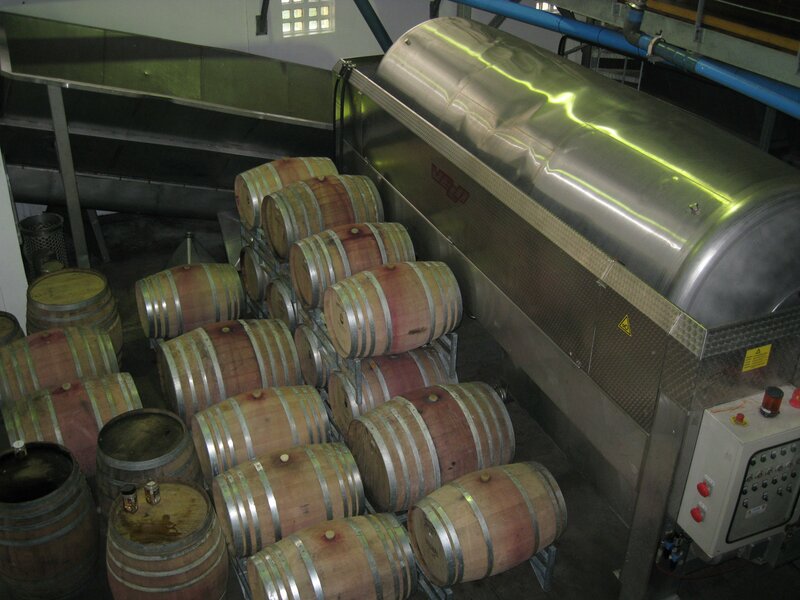 and once on a wine tour on a backpacker tour that resulted in 27 tastings at five wineries. At least I’m pretty sure it was 27, no one spits out the wine on the backpacker tour so there were quite a few “where the hell did that picture come from? !” moments when reviewing my photos, as the end was quite fuzzy. But because it was a wine tour that means we were being classy about it, right? The one winery whose name I remember from the backpacker tour was the Fairview Winery– part because my elementary school was called Fairview, and mainly because it was first. The above tower for their mountain goat mascots is their symbol on all their wine label (they make some mean goat cheese as well! ), called Goats Do Roam. I was also very excited to discover my local liquor store here in Cleveland carries bottles from this winery, so it’s worth keeping an eye out for them! Switching gears, this was lunch at the winery after my dad gave his talk- no, all those glasses were not mine. 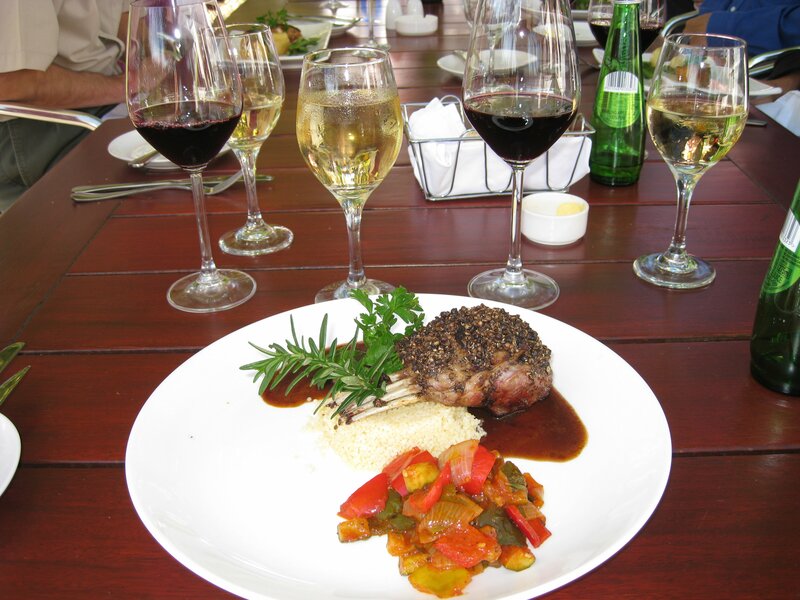 Rather I am taking this moment to give you the general advice about South African wines is that their reds are far better than the whites from this region- in particular you should keep an eye out for a variety of wine called pinotage made only in South Africa. It is a cross between pinot noir and cinsaut, and I’m sort of in love with it. Speaking of things I am in love with, I don’t think I’ve introduced you to the sunbird yet. They are a lovely nectar-drinking bird found down here that I never ceased being happy to see the whole time I was in the country. Finally, Dutch-style architecture typical of the Stellenbosch region, complete with European trees planted around here so you fully feel like you’re a few thousand kilometers north (the peaks around here even get snow in the winter!). I was confused about the whole history of the area for a little while- what on Earth were the Dutch doing running vineyards when they don’t know the first thing about the craft? But it turns out this area was settled by French Huguenots in the seventeenth century fleeing persecution in Europe at the time. 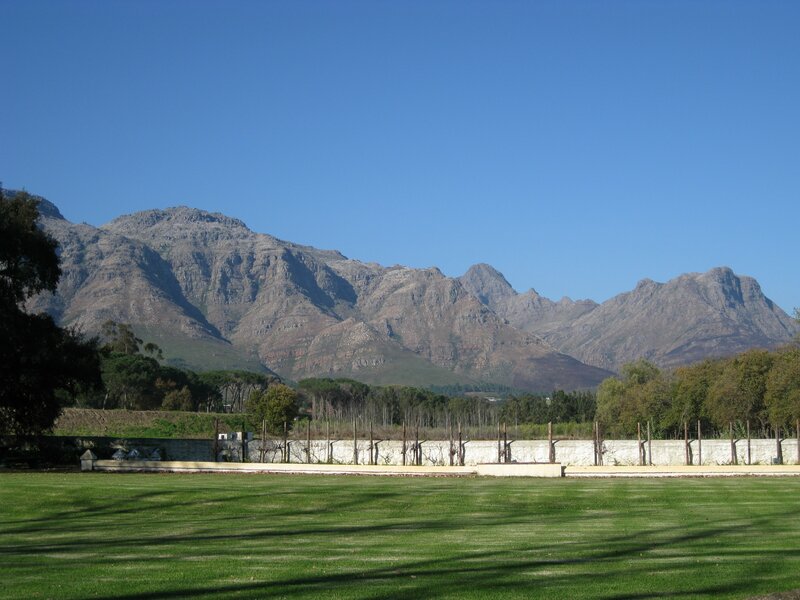 Back then the Dutch colony was really only the size of Cape Town so they sent the Huguenots out into the boonies of Stellenbosch, where they proceeded to make delicious wines. Funny how these things work out. It’s hard to go long in South Africa without seeing the remnants of apartheid wherever you go. What always shocks me about it is how very recent it is- the new South African government is celebrating its 15th year and Nelson Mandela celebrated his 91st birthday while I was in the country. I’m going to place a bet that a lot of readers my age only have a fuzzy idea of what apartheid means as it’s not like you studied African history in school, let alone something that happened so recently. (It’s like how anything you know about the end of the Cold War was probably self-taught because your history teacher doesn’t realize you were a toddler.) So here is the bare-bones explanation: during the majority of the 20th century South Africa had the apartheid system in order to maintain white supremacy in their majority-black nation. (“Apartheid” is the Afrikaans word for “apart.” The Afrikaaners are descendants of the first Dutch settlers in South Africa from the sixteenth century, also referred to as Boers by the other main white group, the English. The English invented the first concentration camps during their wars against the Boers in the turn of the 20th century so the two don’t like each other, but that’s another story.) Under apartheid everyone in the nation was classified as “white,” “black,” “colored (Indian/Malay descent)”, or “mixed,” and you could only live in areas designated for your race, had to carry a passbook at all times showing you were allowed to be where you were… you get the idea. South Africa officially got its new democratic government in landmark elections in 1994, but the most enduring symbol of apartheid government preceding it is Robben Island, seven kilometers out from Cape Town. 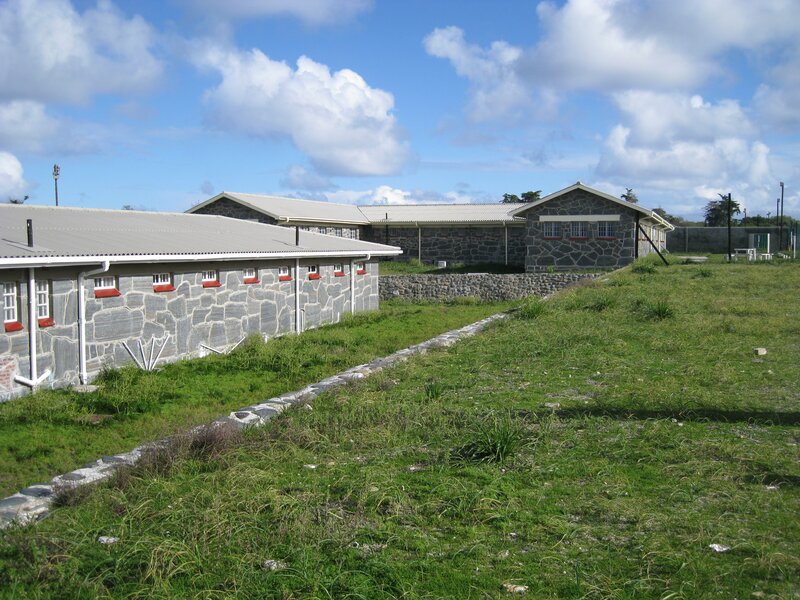 Robben Island was where all the (black) political prisoners from the apartheid era were held, most famous of whom is Nelson Mandela, leader for several decades of the African National Congress (ANC, the illegal political party arguing for black equality) who served eighteen of his 27 years in prison here. Nowadays it’s a popular tourist attraction in Cape Town, sort of like Alcatraz but these guys didn’t deserve to be here, so I took the ferry out one afternoon. The view from Robben Island back towards Cape Town, a half hour boat journey away. Robben Island has been a prison of one sort or another for several centuries and it’s worth noting that only one man in history ever managed to escape- he stole a small boat, and did this in the seventeenth century. So you needn’t bother with a swimming attempt! 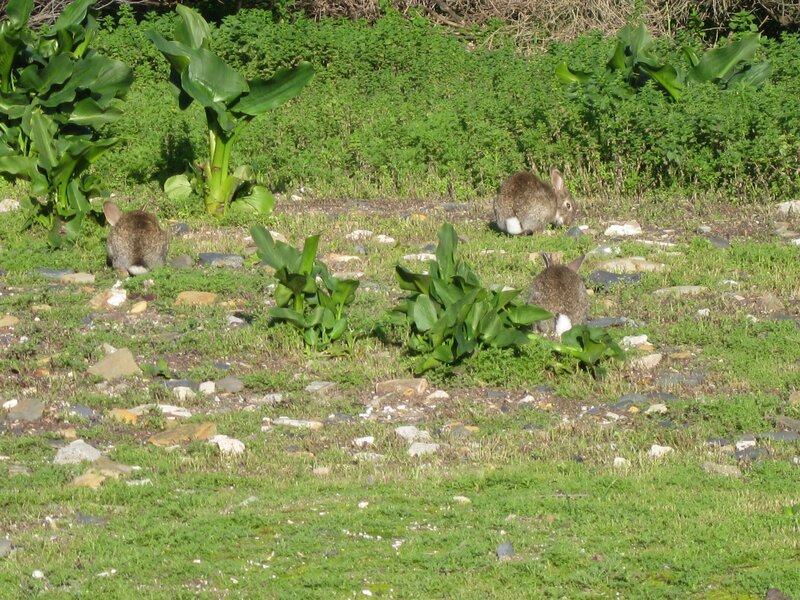 Oh yeah, and it’s hard not to notice that the island is overrun with bunnies- giant, fat bunnies introduced a few centuries ago to an island with no predators so they do nothing but casually hop along the roadside to eat more grass to give birth to more bunnies. They’re trying to cull the rabbit herd by 10,000 or so, we’ll see how well that goes. 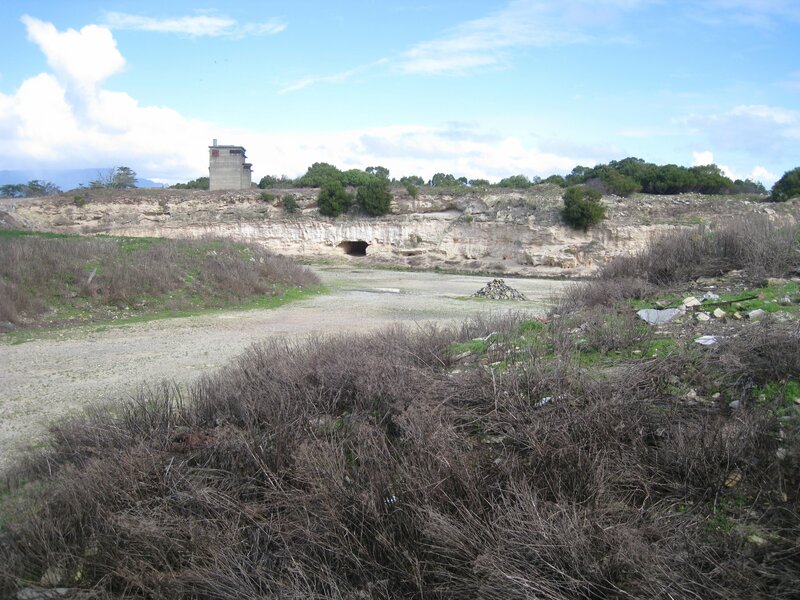 To continue the island tour, this is the infamous lime quarry where the leaders of the political prisoners did forced labor for several years (the rocks were used for an extensive road network on the island). Most political prisoners were members of the intelligentsia- primarily lawyers but a host of other educated people- so the work was supposed to be punishment but ended up being the only time many people in solitary confinement could share ideas. So that backfired on those in charge of the prison, sort of like how they used to house political prisoners with the dangerous convicts until the political ones started converting the convicts. To tour the prison itself is a fascinating experience because the tour guides are actually former prisoners (something tells me they never thought at the time that they’d be doing this!). This is our guide whose name embarrassingly eludes me who spent ten years in Block C of the prison. His story went something like this: at the age of eighteen he was living in Soweto township in Johannesburg frustrated by his lack of educational prospects, so he joined the youth branch of the ANC (illegal act #1). He also left South Africa (illegal act #2) to recieve guerrilla training in Angola (illegal act #3) before coming back (second illegal border crossing) and was an ANC organizer (#5) until he got caught. Back in those days you were held at the local police station up to six months until you got charged, and it was a bit eye-opening to listen to someone describe the torture that occurred at the police stations in those days. At this point it seems appropriate to mention the Afrikaaner view of apartheid, which I heard from a very kind but opinionated hostel owner a few days later. He says the international opinion of apartheid (which resulted in sanctions by most other nations during the era) is grossly exaggerated, as the main reason for apartheid was the blacks were backed by the Communists and you couldn’t let the commies take over South Africa. He has never been unkind to black people and never knows any other white people who were either and things are pretty much the same as they were during the apartheid times anyway, as you still have blacks as the poorer class and whites on top. Some people got a little beat up by police who didn’t deserve it but that happens all over the world, right? This is the cell where Nelson Mandela spent eighteen years in solitary confinement. It’s hard to describe what an incredible statesman Mandela was throughout his life, but what amazes me most is what he did after his release in 1990. For starters, he forgave the government that had imprisoned him for so many years, believing there was no way forward as one country without this. Second, he kept the most prosperous nation on the continent together during a tumultuous transition in which frankly a lesser person would have failed (case in point: virtually every other African transition). The more you look into it the more impossible it is to not fully admire the man.